Well, you’ll just have to watch the video at the bottom for the proof. Just consider yourself warned! "Aren’t I cute when i’m smiling?" What can I say…I guess I’m already being the proud dad! So here’s the deal: there’s a great guy in our church who did these for us. He works for Medison which is the company responsible for developing the technology to make these things possible. Here’s the cool part. They do training sessions for sonographers in the medical field and need pregnant women to train with regularly. So if you’re interested in getting some shots of your own (and you’re pregnant, of course), go to their website, give them a call, and they should schedule a time for you to come in and be a part of the training. 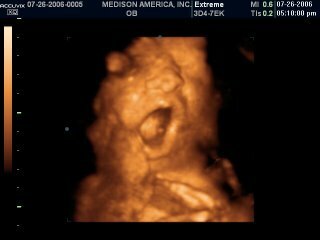 They get the patient, you get the sonogram and pictures absolutely free! I think they said they look for ladies at either 20 weeks or so and 28-30 weeks. We also got some great video clips that I threw together to make a short little video with the pics. Check it out below if you wanna! 2 more months!! 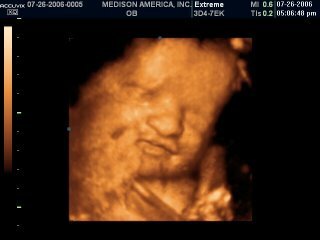 Rick- This is taken at 31 weeks…we think. It’s possible that we may be a few weeks further along than that. That was totally awesome, Bobby. Good job, I think he looks like you! Can’t wait to see you and Rachel in a couple of weeks. Enjoyed her blog also, first time I’ve seen her pregnant. Dude, my boys are 14 and 10, and we didn’t have those kind of sonograms way back then. I can’t believe the detail on those things. If you were a computer animation artist, you could have a lot of fun with making that kid do all kinds of funny things on the video. Congratulations to the both of you. How far along are we? Wow! That’s awesome man! How cool! Those are beautiful pictures…. I was at that exact place about a year ago and it’s exciting. Enjoy all this stuff… it goes by pretty quick. Wow, those are the best pictures that I have ever seen! Isn’t it amazing to get such a great sneek peak? 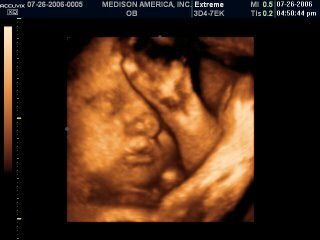 We did a 4D with Joshua at 20 weeks, but the pictures weren’t nearly that clear. I already put my name on the Medison list! I’m totally freaked out. I can’t believe you see that much facial detail. I’ve never seen the much detail even on a 4D. Congrats to a great couple!